Here's a quick run down of the Black Powder Napoleonic game I hosted at Enfilade! this past Friday night. I had a full game with six players running a combined arms brigade each. Granted this brigade composition isn't historically accurate, but built for more varied game play. The players seemed to like it. 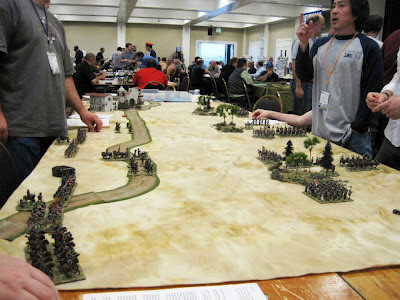 IIRC correctly only one of the players had read the rules, and one had played Warmaster - which is what Black Powder is supposedly descended from. The scenario was based loosely on the Battle of Salamanca - where Marmont's forces were caught with their pantaloons down by Wellington. 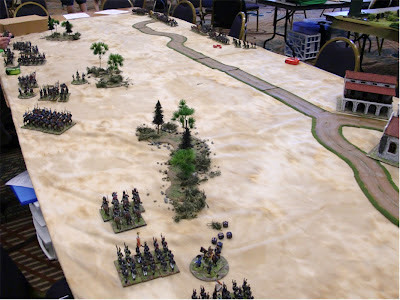 The French needed to get at least 50 percent of their forces off the western edge of the table to win; the British would win if they prevented this. Without further ado, here is the photographic evidence of this game. 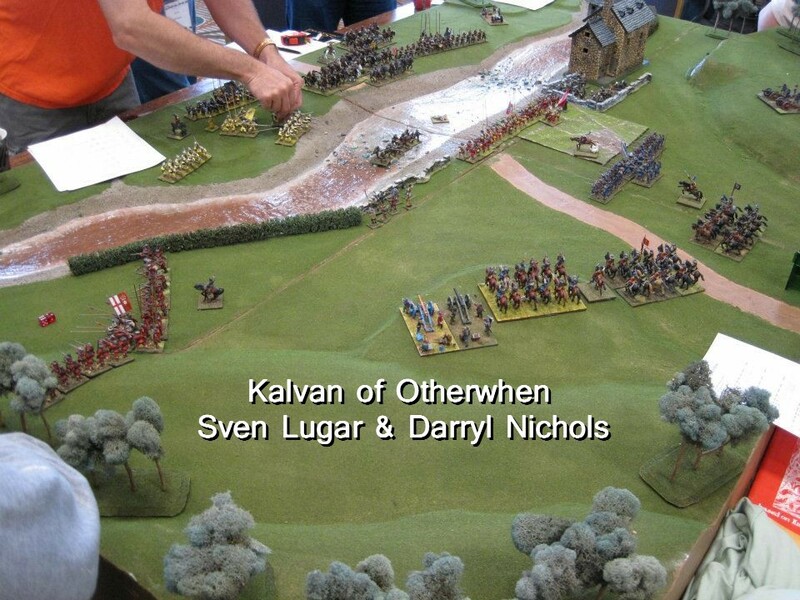 (Note: several of the photos were taken by one of the players, Mike Evans of Relic Miniatures). Initial set up - three French brigades moving in a westerly direction; two of three British brigades already in line facing the French. Mancune's French in the center of the battlefield. 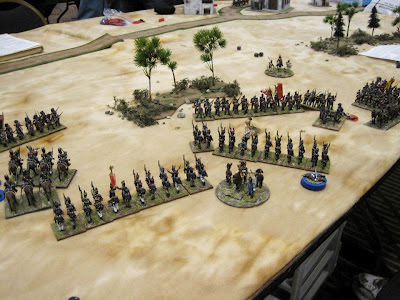 French Hussars already routed off the field. Bird's eye view of the center after a couple of turns. Most of the French cavalry having already been destroyed or fled off the battlefield. The game was called after about the 5th or 6th turn - who can remember these things in the heat of battle. The British were declared victors - much like history; the French although having being mauled, still had a few remaining units that could have worked their way off the board per the victory conditions, but enough units had been destroyed to prevent their victory condition. 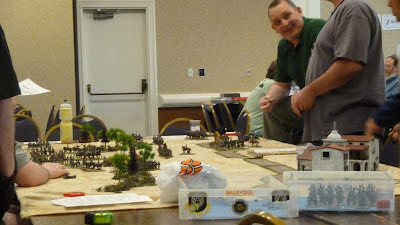 I had a great time hosting this game and really feel Black Powder works well for convention games with gamers who have little or no prior experience with the rules. Black Powder is easy to pick up and yet allows for some friction and unpredictable outcomes. That all said, I am taking a break from the rules, and Napoleonics in general. 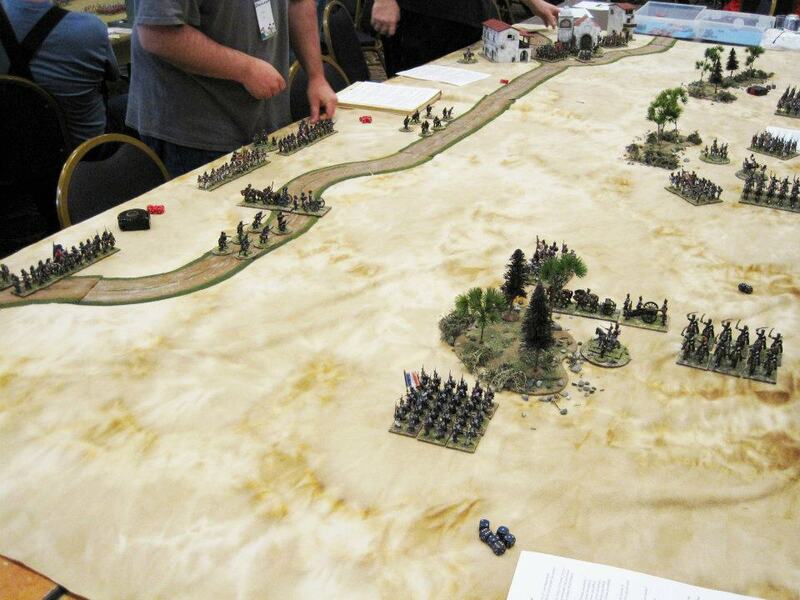 I am determined to get my Roman Seas game back on track - just ordered a hexed game mat from Hotz. 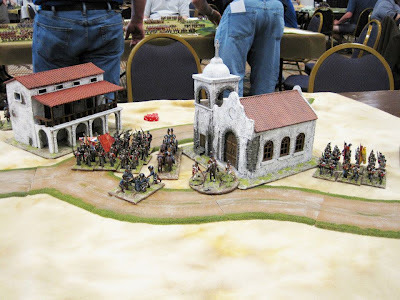 I also plan to paint up some Old Glory Ancients that I picked up at the Bring and Buy for an initial Hail Caesar game (hey, that's close enough to Black Powder ain't it). Just got home after a great three-day historical convention here in the beautiful Pacific Northwest. We had folks coming in from several nearby (and not-so nearby) states, as well as our cousins up in Vancouver B.C. Again, the volunteer spirit is so impressive at this gathering. No shortage of volunteers to run the registration desk, the bring and buy table (which was another huge success), as well as the tireless game masters. Thank you one and all! Here is just a handful of photos from the 120-plus games that I managed to take that weren't too out of focus. I captioned the ones that I'm pretty sure of; sorry for missing the names of the others. 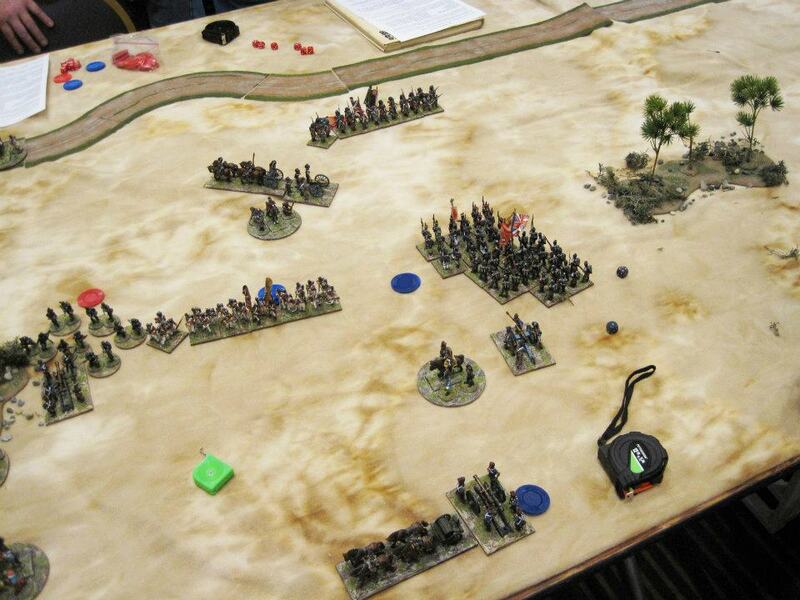 The next two pictures are from my Black Powder game I hosted on Friday night. 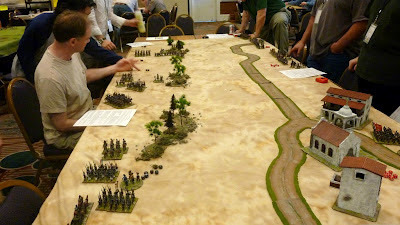 The six players had never played the rules before (although one or two had the book, and one was a Warmaster veteran). They all said they had a great time and the play was fast and furious. In honor of the Mayan calendar, I had to get into this game. 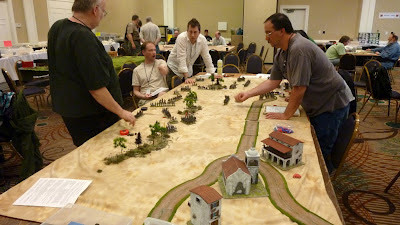 Most of the players, including me, never played Fields of Glory - but the GM made the game flow well. This is the last of my three WAB games I played on Sunday - ending in a tie; my previous two were losses - but I don't care as I had fun and was pretty tired already anyway. I'm sure there will be other folks who attended posting more (and better pics) from the convention soon. As an aside, I didn't spend too much time in the bring & buy area, but I did score three bags of Old Glory for $10.00 each - Sherden, Phillistines and Anatolians. I plan to build these units for a Hail Caesar game. I also picked up some OOP Foundry German WWI HMG teams (with picklehaube). Heading out to our big annual historical gaming convention, Enfilade! Traditionally held over the Memorial Day weekend. I'm hosting a Black Powder game on Friday night, participating in a WAB "social" event on Saturday and a WAB tournament on Sunday. 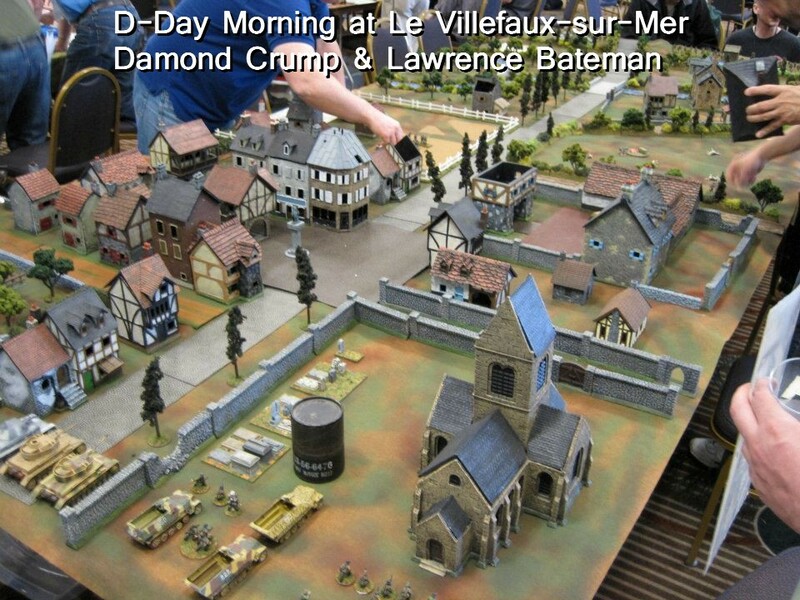 In between I hope to get in some other games, including a Great War game my buddy James is hosting. I will post pictures in the near future. Well I finally got around to painting and basing the C in C 1/1200th Roman ships I bought from a fellow TMPer several months ago. I split them into two fleets with about equal numbers of liburnian, trireme and quinquereme. I still have several cargo ships to paint too. Here they are representing the portion of the Battle of Actium with Cleopatra preparing to break out - those central ships are previously painted Langton and Valiant models. Here are the C in C models - the red ones are Antony's fleet and the blue ones Octavian's. The previous owner had most of the models painted with brown enamel. I soaked them in Green Stuff and used a toothbrush to remove the old paint. After a black undercoat, the oars were dry brushed a wood color. As they are about 60 of these total - I went into a production line method of painting. No fancy colors - just basic red and blue besides the natural wood areas. I think the ones with covered decks are the quinqueremes - I think. For the bases I cut up a plastic sign from a hardware store (Lowe's). This was a tip from a TMP post - the plastic is the same type as the Evergreen ones sold in hobby shops; but at a fraction of the cost. This sign cost about $5.00. Acrylic caulking was textured onto the bases and painted a blue green with white caps. I currently have Roman Seas for rules, but plan on trying other sets out too. I would like a set with less charts; Roman Seas is still a good set though. I like using a hex mat for ease of movement too. This was part of a grab bag of Napoleonic figures I received in a TMP trade. Fellow blogger Legion Games mentioned it was part of a free promo that came with an old Wargames Illustrated. Anyway, I painted him up as a British general in Hussar uniform - based on the illustration in Uniforms of the Peninsular War by Haythornthwaite. ADDENDUM: Thanks to HGA's post, I see this figure is supposed to be Sir Stapleton Cotton - sculpted by Copplestone and carried by North Star. It's a nice figure, if somewhat one-dimensional; the horse and rider are cast as one piece and reminds me of a flat - but of course it's not. Nonetheless, the sculpting is nice and the leopard skin shabraque is well detailed. Here are examples of what the Haythornthwaite book illustration is based upon. One a portrait of Lord Londonderry. 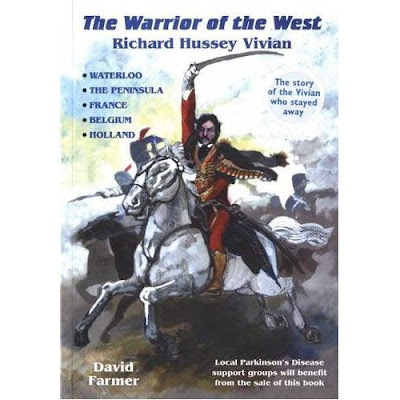 Another of Sir Richard Hussey. Hussar attire has always been associated with the great. Well, these six have been sitting around for awhile; I ordered them from Miniature Service Center when they were clearing out their stock of Redoubt several years ago. I had intended to use them as chariot warriors, and may still do, but for now they are palace guards. I replaced their lead spear shafts with brass rod - sturdier for gaming. I also carved off their shield strap and Green Stuff'd the left pauldron where the strap had been. Painting was straight-forward as I decided to give them uniform colors - they were then given a Minwax Tudor Satin stain. The bronze is a mixture of Vallejo Bronze & Copper (about 50:50) some gold and silver added as highlights before the stain. Here they around the hearth protecting the king and his ladies. And halting an uninvited Herakles and friends at the door. Now cornering Medusa - they soon turned to stone. Happy Mother's Day. I need to call my brother later today in Hawaii, my 80 year old mom had flu-like symptoms and was taken to the hospital late night their time. North Carolina math teacher and one time Prince of Moscow. 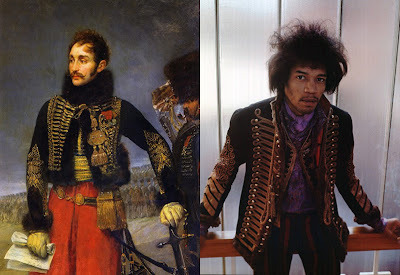 Of course, I'm jesting on the myth that Marshal Michel Ney, the Bravest of the Brave, faked his death by firing squad in December 1815 and secretly made his way to the United States. In any case, here is a nice new sculpture of him by Mike Owen. He is flanked in the photo below by a pair of stands of Perry and Victrix plastics for comparison. I received the figure from Pat Lowinger who picked it up at his recent Adepticon sojourn. Thanks, Pat! The figure can be painted up rather quickly as the only area needing some effort is the face. The greatcoat covers most of the rest of the figure. I got a little creative and sprinkled on some spackling powder on the base. The figure is being sold by Gorgon Studios.